St. Anastasia lived in the time of the Roman Emperor Diocletian, who led a strong persecution against the Christians, the last before the Edict of Milan in a.d. 313 which ended the age of great martyrdom. She was a noble matron of Rome and a spiritual disciple of St. Chrysogenos. Because of her great love and respect for the Christian martyrs, she became widely known for her ministrations to those suffering for Christ, washing their wounds and loosening their bonds. 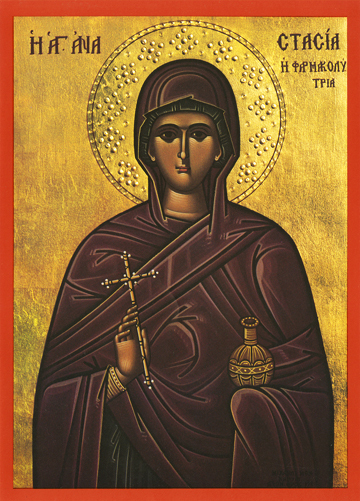 She is shown in this icon holding a vessel of medicines, which is a symbol of a holy healer. Mercy is one of the chief defining features of a true Christian life. For this loving and healing ministry to the martyrs, St. Anastasia was imprisoned, tortured, and burned alive for the Faith in a.d. 304. The cross that she holds is a symbol of the calm and thankful acceptance of her sufferings and death for the sake of Christ. The name Anastasia means “the Resurrection,” and in St. Anastasia’s life this was literally fulfilled, for in loving the martyrs, tending their wounds and encouraging them, she then found by her own death Life Itself, Jesus Christ, Who is the Resurrection for us.